Through vast drawing installation and intimate sculptural elements, Esther Simmonds Macadam's practice investigates codes of figurative display. She creates portraits that are equal parts deconstructed monument and phantasmagoria. Themes of grandeur, cultural memory and contemporary identity are offset by a deliberate self-pleasure from re-ordering bodies in public space the way she wishes to see them. Esther Simmonds-MacAdam holds an MA from the University of Toronto in Sociology and Equity Studies and a BA in Woman’s Studies from Concordia University in Montreal. 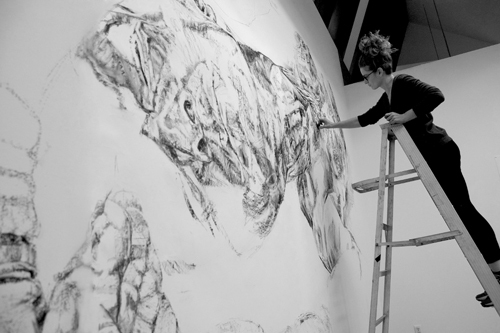 She has participated in residencies at The Banff Centre (2012, 2013) and created site-specific installations for The Gateway Project at Newark Penn Station, The Art Gallery of Peterborough and The Art Gallery of Ontario. A current project, separates the man from the horse will be presented at Ace Art Inc, (Winnipeg) in the fall of 2015.